Pre-heat vegetable oil in large pot or deep fryer to 350 degrees. Place grouper filets one at a time into breader, toss until thoroughly coated. Shake to remove excess breader. Place fish in hot oil and fry for 4-6 minutes until golden brown. Do not overcook; fish will continue to cook after you remove it from the oil. Remove from oil and drain on paper towel lined platter. Divide grits into 4 bowls. Spoon sauce mixture equally into bowls on top of grits. Do not stir up. 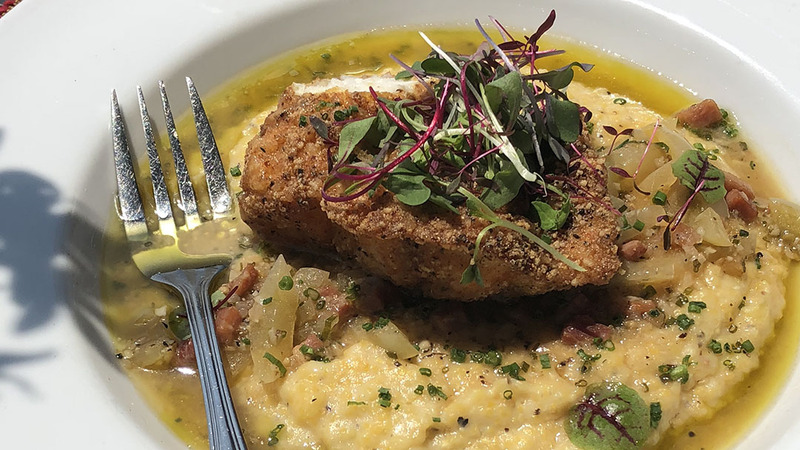 Place cooked Grouper filet on top of grits. Garnish with fresh chive (optional).